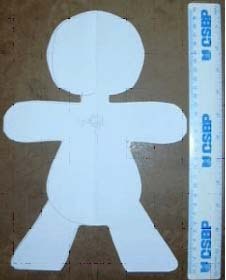 Start by drawing a doll shape, any shape you want, any size you want. Cut out the doll shape and fold it in half, making sure both sides are the same. Sometimes you have to retrace the doll and cut a new one. If you don't make sure the both sides are the same then you will end up with an odd looking doll. 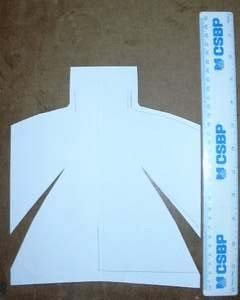 Cut 2 of these out of fabric (singlet fabric used in example). Use any fabric you like. When drawing faces most fabrics will bleed. You can also use a transfer for the face. If using a transfer for the face, do that step before stuffing. Right sides together, sew all round the edges leaving the crotch open to turn and stuff. Now turn and stuff as tight or as loose as you want. Next, take some wool and sew it onto the head for hair. Use a pen to hold the strand as you stitch. This will help make sure the hair is the same length, like you are winding the hair around 2 sticks evenly spaced. Cut the end loops and position hair how you want it. Trace the stuffed body onto a sheet of paper. Add seam allowance and wearing ease. Now you need to draw the clothes over the top of the shape on the paper, e.g. draw a shirt and some pants, making sure you leave enough room to turn over the top and add elastic and a hem for the bottom of the shirt. You will see 2 lines across the middle (see above image) of clothes pattern. These are the cut lines. The top is for the shirt and the bottom line is for the pants. You will need to add seam allowance when you cut this piece. 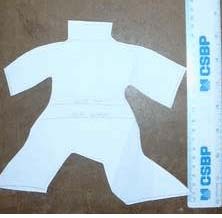 It is important that you add at least 1” or 1 ½” (2.5 to 3.8 cm) around the edges of the clothes pattern or you won't be able to get them onto the doll. Draw a cloak pattern, using the above technique, so that it looks similar to the one in the picture. You may want to make the bottom flair a little more if you want his cloak to close at the front bottom or to be more realistic. 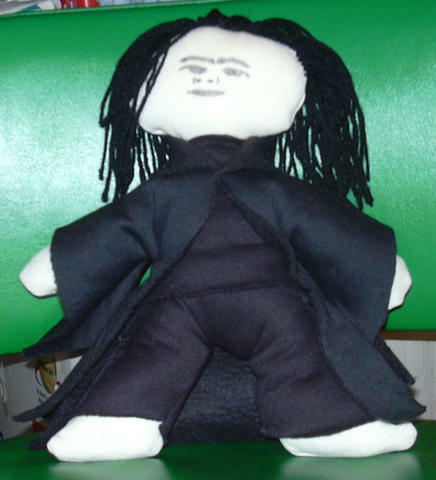 The example is made so that it looks like Snape is holding the cloak back behind him. Dress Snape and you are done! © Tanya's tutorial was taken with permission from tanzab.blogspot.com.